﻿ Look What I Just Got! - J-RPG Blog! Per Andy's request, I've cross-posted this from my RPG blog. I now have the care package of Japanese RPGs and such that Andy picked up for me in Japan. It's been a while since I got more TRPG action, and now I have a huge stack of books to go through. (I put all of the pictures up on Flickr). I'll be posting extensively about this stuff as I read it, but here's a quick lowdown of my initial impressions. 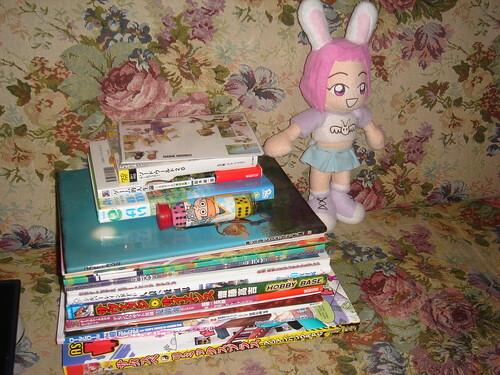 First, here's a picture of the loot. Be impressed. Demon Parasite is a "Dark Henshin Hero" RPG, for stuff in the vein of Garo and Hakaider. This is apparently a complete game, basically DP with stuff based on Japanese mythology rather than just animals and such. 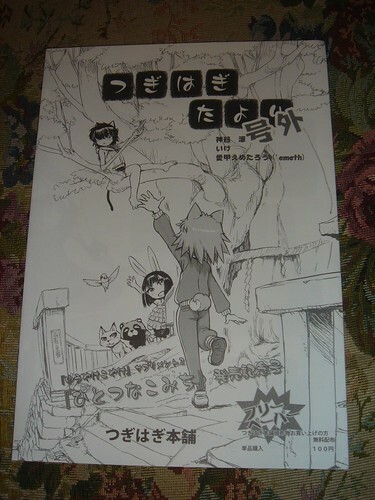 This is a doujin from Kamiya-sensei's circle. 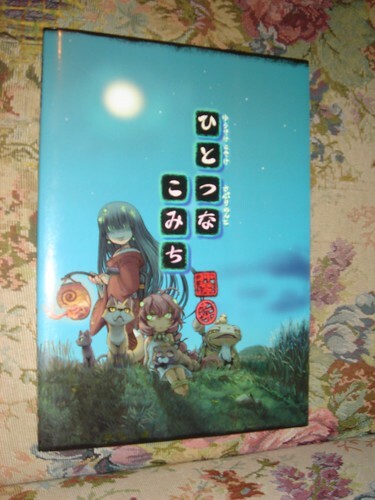 It's a sort of Yuuyake Koyake/Witch Quest crossover book, with one replay for each, and a dialogue between Kamiya and Sasuu. 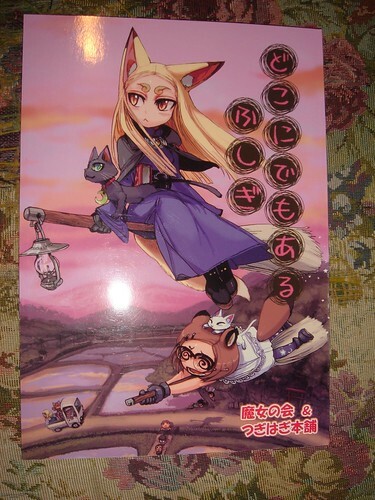 This is a doujinshi Touhou TRPG. I know next to nothing about Touhou, to be honest, but I've been meaning to rectify that. I've heard that it has an exceptionally good introduction to role-playing, and it does start off with a couple pages with cute little diagrams and such. Character creation apparently involves picking one of 8 flowers, and one of 5 races. 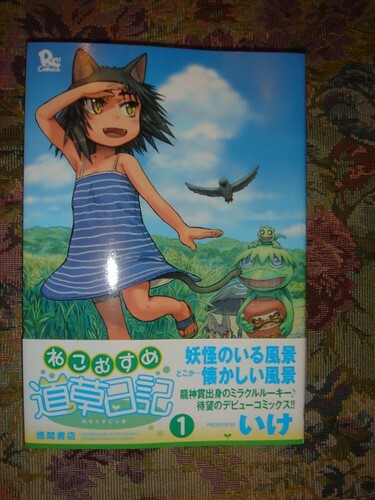 The second supplement for Yuuyake Koyake weighs in at 56 pages. The main attraction here is that you can now play as "Old Henge," types of animals that were previously only NPC local gods: spiders, snakes, and centipedes. There are also rules for creating new types of animals, with turtles as an example. It's also got two scenarios, some stories, and a new relationship chart. 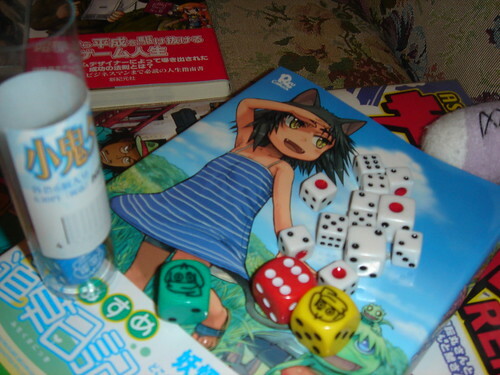 This is an earlier game from the publisher of Meikyuu Kingdom. The title is short for "Saturday Night Special," and it's a gonzo "Asian Punk RPG." The artwork is apparently by the same artist that did most of the interior art for Meikyuu Kingdom, and pages without some kind of artwork are the exception to the rule. It looks like all kinds of crazy fun. This game is about total weirdos attending a normal high school. You can play a soldier, a la Full Metal Panic, but the character types also include kendo practitioners, cyborgs, magicians, espers, and vampires. The game uses playing cards, and there's definitely something neat going on with using the cards to set up relationships with pre-made NPCs from the school. Sword World was the first major original RPG from Japan. Record of the Lodoss War actually takes place in a corner of its setting. And this is the second edition. 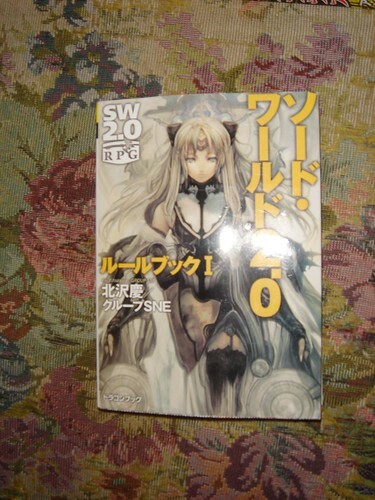 It's in bunko (Japanese paperback) format, but it's also nearly 400 pages, and this is just Rulebook I, basically the Player's Handbook of Sword World. Skimming through, it comes off as being kind of a generic fantasy RPG, but with a definite crazy manga/Final Fantasy/Disgaea sensibility to it. 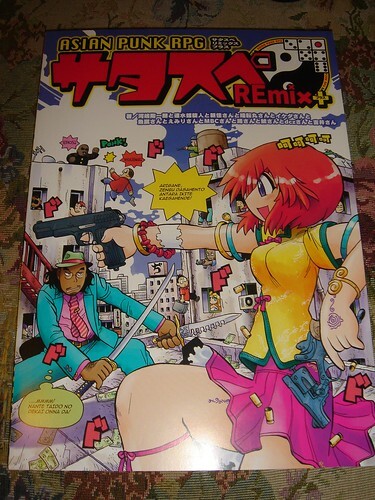 Another doujin from Kamiya's circle. It has a game called "Kosodate Dragon" (literally "Raising a Dragon," though I'd call it "Dragon Nursery" or some such if I translated it). It also has an article about the countryside that I'm looking forward to reading, a Yuuyake Koyake store (a straight-up story written in prose), an article on the "secret story of the birth of Absolute Slaves," and the first part of what looks like an academic paper on RPGs. 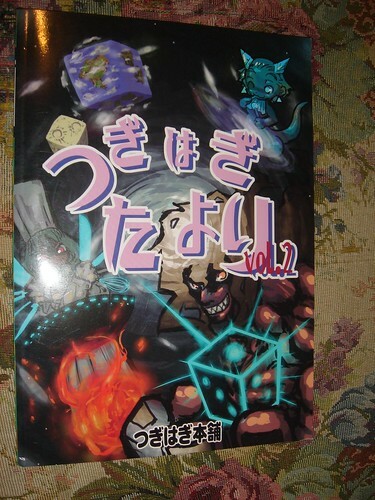 This volume kicks off with Mugen Daiuchuu (Infinite Universe), a mini RPG about crazy rampages through the cosmos, accompanied by a replay that's around twice the length of the actual rules. After that, there's an article on NPC-driven game sessions, another Yuuyake Koyake story, and a couple of YK 4-panel comics, and finally the next part of that paper. 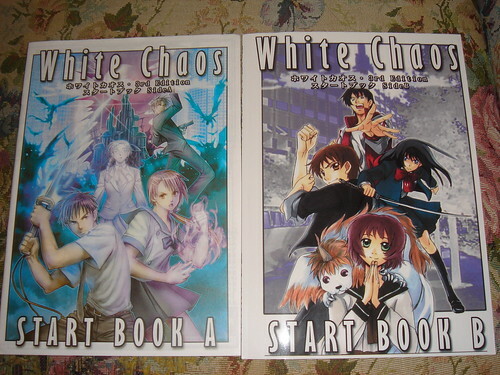 This is a doujin RPG, apparently about high school monster hunters, kind of in the vein of the Persona PS2 games. 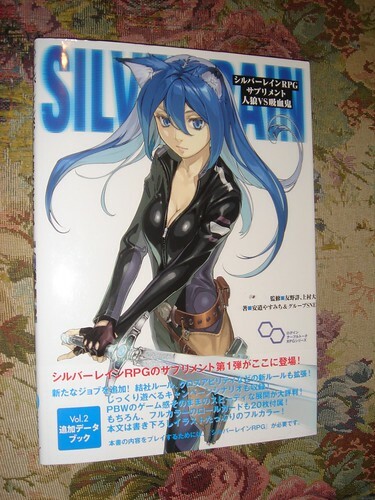 Start Book A is a manga explaining the basics, about 20 pages or so. Start Book B is the actual rules. The text is very dense, but it has all of the stuff you'd expect from a TRPG, the full rules for playing, a replay, and 2 scenarios. 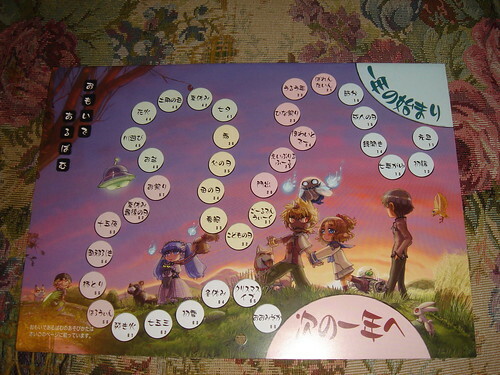 Yeah, the year's pretty much over, but it has more color artwork, and a mini-game on the back. And... going through all that took me more than 2 hours. Wow. Damn dude, I'm jealous. Looks like so much cool stuff. 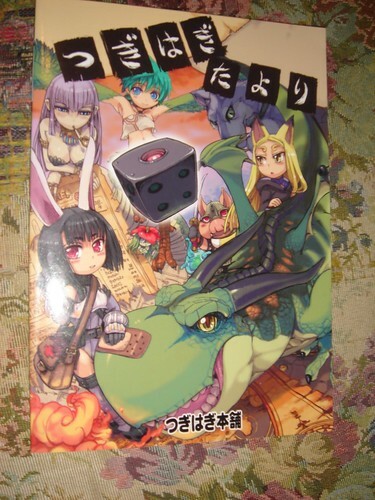 I always wondered how the "Indie RPGs" are published in Japan. As much as it makes terrible sense, I wouldn't have thought about their doujinshi format. Where does one find those? In a doujinshi shop or at the rpg shops? And how expensive are they? Best "One True Way" to learn more about the Touhou Project stuff is to actually play some of the games for a bit. That way you get introduced to the characters, music and crazy danmaku goodness. Also it's nice to at least know about the canon behaviour of the characters before you meet the fan versions. I would like to hear more about "flowers". Would interest me how good it emulates magical girl stories in general. I'm still looking for a good system for stuff like Nanoha or Touhou. Also because that would almost automatically be a perfect fit for super robot stuff. Geat stuff! Thanks for sharing. Andy probably knows better than I do, but apparently doujinshi TRPG stuff is available at both Comiket (and its ilk) and the game shops that sell regular TRPGs. He picked up both Flowers and White Chaos for about 1000 yen each. 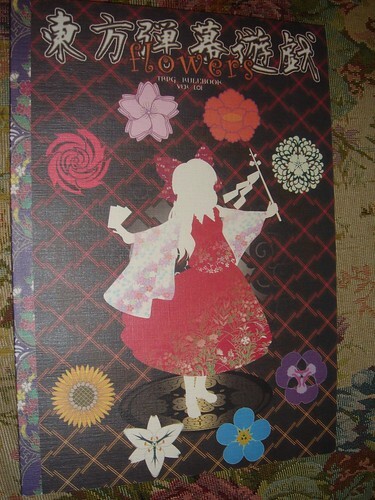 In the case of Flowers, their blog mentions that they'll be selling it at a Touhou-only event that's coming up. 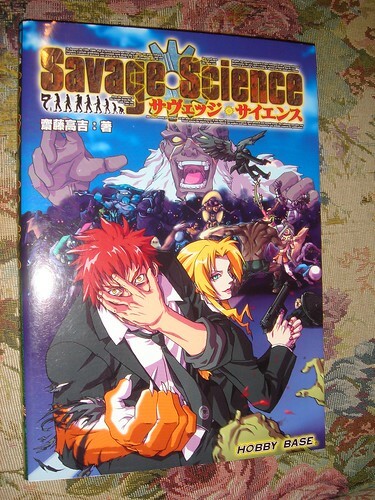 I'll be posting about the stuff I got as I read through it, though at the moment my first priority is reading through the new Yuuyake Koyake stuff. Wait, is Flowers about mahou shoujo or about shooters? It's a tabletop RPG adaptation of the Touhou Project games, so... both, I suppose. I want English versions of all these, darn it! >.